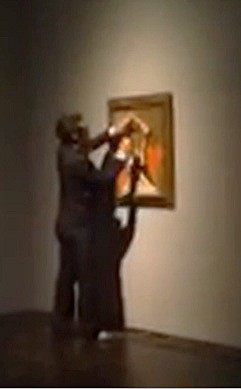 What would you do if you witnessed someone on the verge of damaging an artwork hanging in a museum? Would you record the event on your cellphone and murmur “WTF?” into its microphone, like the person at the Menil Collection last week who witnessed the defacing of a Picasso? Or would you do something like what I did, when I saw a clueless student at the Philadelphia Museum of Art, who was about to employ a Cézanne portrait of his wife as the ideal surface against which to rest his worksheet while filling in its blanks? I screamed, “NO-O-O-O-O-O!! !“—loud enough to stop the student and to attract the attention of the nearby guard. I didn’t need to think about this. It just happened. 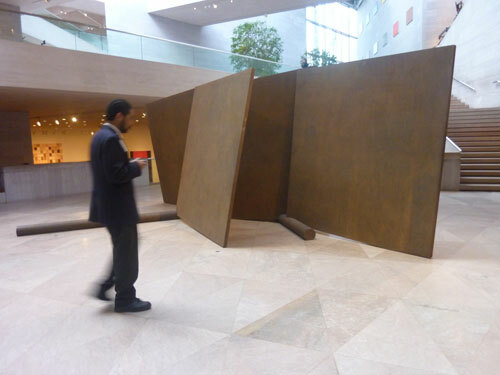 My unstated reaction when I viewed the video taken at the Houston museum has now been given voice in an Associated Press follow-up article (which also provides details about the Menil’s conservation efforts). some speculating whether the two were working together. Maybe this documentation of a crime was complicity, or maybe stupidity. We’ve become a nation so obsessed with our electronic devices that we sometimes forget to privilege the real world over the digital. Don’t walk into that Serra! I propose that guards be forbidden to carry smartphones while on duty. They’re just too addictively distracting. But back to Houston: Lovano also reported that the Menil “will review its security measures, which include surveillance cameras and two dozen guards.” I have asked the museum how many of those guards were actually on duty at the time of the incident. I’ll update if and when I receive a reply.